Music Studio 2.0 - This seems to be the most full-featured iOS "DAW" right now, integrating audio and MIDI recording like a mini version of Sonar X1 (though still not nearly as full-featured). The audio recording is new in the recent 2.0 version. 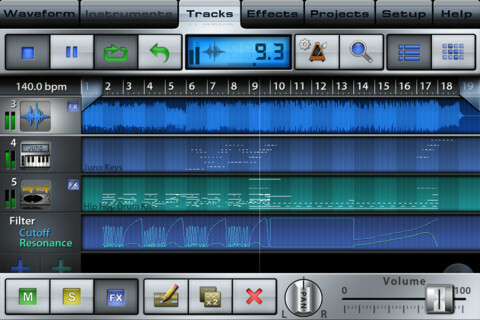 At about $14, this is one of the more expensive apps I have ever bought, but for what it can do, it's quite a bargain. The MIDI instrument samples are not fantastic quality (file size for one thing - as it is this is a 300+ MB app), but they sound pretty good through headphones, and you can always export the MIDI (and WAV) tracks for further work on PC or Mac-based recording software. Strumstage - This is the most naturally playable guitar app yet (although iShred and Guitar Studio are close). The key here is that there are only three large "frets" that are used to choose from a palette of seven pre-selected chords (there are pre-defined palettes, plus you can define your own). Since it's easy to finger the chords, you can concentrate on strumming or picking. Take a look at this video to see what I mean. It also has drum and bass backing parts you can choose from a small list (the bass parts key off the chords you are playing). 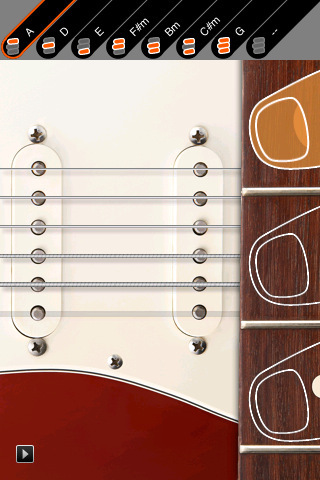 You can spend another couple of dollars and download additional guitars and rhythm kits inside the app. Animoog - From the makers of classic Moog synthesizers, this app creates some amazing sounds and is almost infinitely controllable. Check out the demo video (makes me wish I had an iPad but it works fine on my new fourth generation iPod Touch). This is a $30 app which I got for 99 cents during its 30 day introductory period. Check out the demo videos on this page. Ah yes, that new iPod. That has really increased the average cost of these apps. But (rationalization alert!) I had been wanting to get a new iPod Touch for at least a year - higher res display, faster processor, more memory (64 GB), cameras, and especially a built-in microphone. Just being able to record a song idea without having to find and plug in an external microphone is a major advantage. I also bought a new attachment called iRig MIDI which allows me to connect the iPod to a MIDI keyboard or to the MIDI interface on my PC. This works with Music Studio, Animoog, Thumbjam, and many other music apps that support the "Core MIDI" standard on iOS. Every one of these tools (ok, toys) has at least one song hidden in it, waiting for me to carve it out, like a statue from a block of marble (often the "statue" just looks like a smaller block of marble). I haven't given up on real instruments either. Last week I received a Rover mandolin that I ordered as a Black Friday deal on Amazon for $83 (it was out of stock for two months). It's clearly a starter instrument, but it sounds OK and is surprisingly playable. I've already got two new songs in work based on the five chords I've learned so far.